The SPAIR pulse sequence is identical to SPIR except it uses a 180º adiabatic fat saturating inversion pulse. SPAIR (SPectral Attenuated Inversion Recovery), like SPIR, is a hybrid technique combining features of both CHESS and STIR. As shown in the diagram right, the sequence begins with a 180º-inverting pulse tuned to the fat resonance. This pulse inverts the longitudinal magnetization of fat so that it lies in the −z-direction. Water protons are not affected. A spoiler gradient destroys any inadvertent transverse magnetization created by the pulse. ​Fat, with its short T1, begins to recover quickly from this inversion and at TI its longitudinal magnetization is zero. An imaging sequence initiated at this time would generate a signal only from water protons (whose net magnetization remains locked along the +z-axis). ​The only substantive difference between SPAIR and SPIR is the nature of the inversion pulses. SPAIR uses an adiabatic pulses. Adiabatic inversion pulses are a special class of RF-pulses capable of accurately rotating longitudinal and transverse magnetization by exactly 180º even when the B1 field is spatially nonuniform. Adiabatic pulses are still at the mercy of Bo inhomogeneities, but are relatively intolerant to spatially dependent changes in flip angle that may occur during RF-excitation. In theory, therefore, SPAIR should provide better and more homogeneous fat suppression than SPIR. The adiabatic phenomenon and pulses have been introduced in a prior Q&A. In brief, these pulses have a quite different behavior than the more familiar amplitude-modulated sinc and gaussian pulses we have previously discussed. Adiabatic pulses are both amplitude- and frequency-modulated, meaning that their transmitted frequency changes simultaneously with amplitude as the pulse evolves. Although fat suppression is improved compared to SPIR or CHESS (FatSat) techniques, the 180º-SPAIR pulses deposit more RF-energy in tissue than the smaller flip angle SPIR or CHESS pulses. 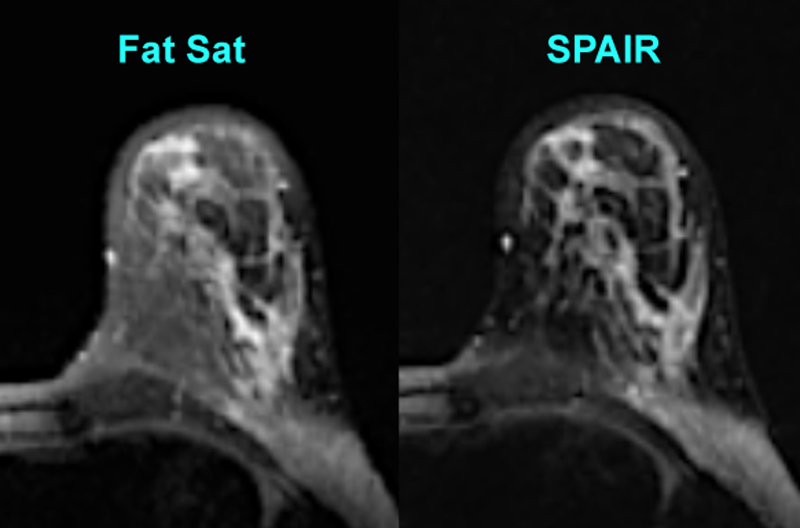 The inversion time is longer in SPAIR than SPIR, so there is a greater penalty in terms of imaging time and reduced number of slices for a given TR. SPIR may thus be better for T1-weighted imaging while SPAIR may be preferred for T2-weighted imaging. T2-weighted breast images using FatSat and SPAIR. Note more uniform fat suppression with SPAIR. Most vendors use the generic term SPAIR to refer to this pulse sequence, and it is particularly popular among users of Philips systems. GE's version is called ASPIR (Adiabatic SPectral Inversion Recovery). Visser F. Application Tip. Optimizing SPIR and SPAIR fat suppression. Philips NetForum Community (http://clinical.netforum.healthcare.philips.com), 2004.